The development of this Model Series was a big breakthrough for Millennium Reign Energy LLC. 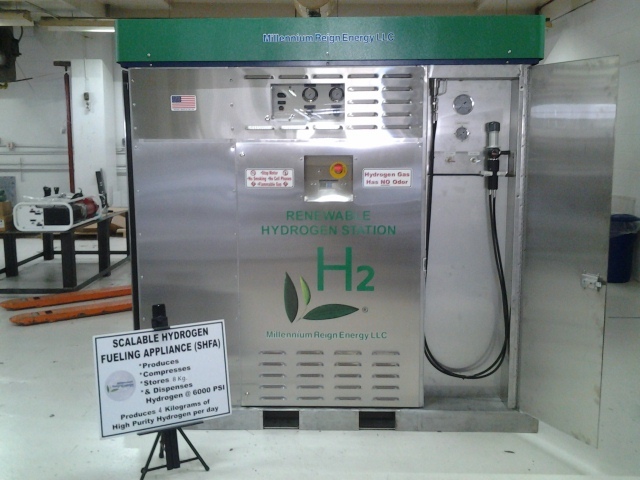 It provides all five required functions for Hydrogen fueling infrastructure. Hydrogen production, purification, compression, storage and dispensing, all in one revolutionary package on a skid. 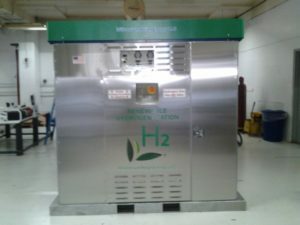 Pictured above gives production of hydrogen by our proprietary alkaline water electrolysis system at 48 kilowatt hours per kilogram, (Patent #US8,465,629 B2 issued June 18th 2013) and makes 2 Kilograms per day of 99.5 purity hydrogen out of the stack at max input power for 24 hours. The H2 can be purified up to 99.995% hydrogen purity with our proprietary palladium based O2 scrubber and desiccant dryers. It Compresses the hydrogen with a hydrogen booster to 6,000 psi. It dispenses thru our proprietary fixed orifice flow control system and a standard J2600 nozzle at 35 MPa. Pictured below the system gives production of hydrogen by our proprietary alkaline water electrolysis system at 48 kilowatt hours per kilogram, (Patent #US8,465,629 B2 issued June 18th 2013) and makes 4 Kilograms per day of 99.5 purity hydrogen out of the stack at max input power for 24 hours. The H2 is purified up to 99.995% hydrogen purity with our proprietary palladium based O2 scrubber and desiccant dryers. 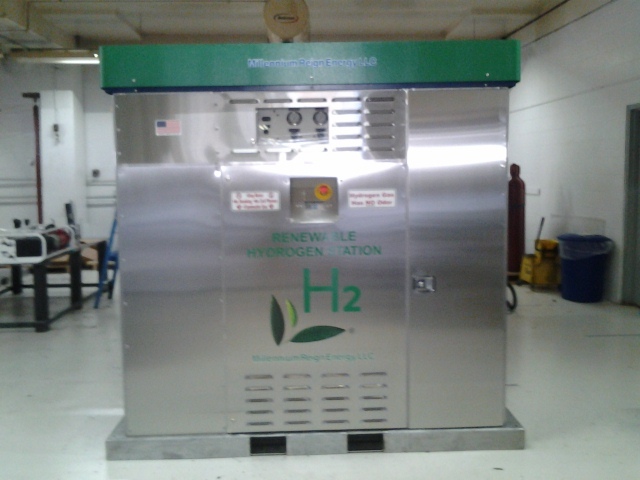 It stores 8 kilograms of hydrogen in D.O.T certified tanks at 6,000 psi. Expandable storage available in units of 6 kilogram package and may be added by external port on system. It dispenses thru our proprietary fixed orifice flow control system and a standard J2600 nozzle. Model 200 comes with 4 kilograms per day H2 production. Additional external storage available in 6 Kilogram skids extra cost for both models and can be added by external port provided. These appliances are encased in a ventilated stainless steel enclosures which protects all hoses and J-2600 dispensing nozzle. Multiple key locked entry points for servicing and dispensing. Safety diagnostics are ran constantly. Fueling nozzle access door will not open if a hydrogen leak has been detected. Mechanical over pressure relief valves on each storage tank. Manual bypass valve to relieve pressure for safe handling. Watch Dog electrical disconnect provides primary mechanical shutdown for all safety critical conditions and the logic controller is a backup redundant safety controller.